TheRustedChain - The Blog: Eleven. 1. We have a few more pounds on us than we did 11 years ago. 2. We have a nicer house than we did. 3. There are more toys on the floor of our home than there were 11 years ago. 4. We have a bigger bed now. 5. That bed often has kids in it. 6. We laugh more now than we did 11 years ago. 7. Back then we didn't know it was even possible to enjoy each other any more. Now we know. 8. We get far fewer date nights now. 9. But we still value them as much, or more. 10. He still lets me borrow his t-shirts in the summer (and socks in the winter) even though that sometimes leaves him scrambling in the morning with nothing to wear. 11. He supports my passions for jewelry and photography, always listening to me when I talk about ISO's and shutter speeds and rusty backgrounds, even though I see his eyes glaze over. Happy 11 year anniversary to my sweetheart who doesn't even read my blog. I'll make him read this though. Haha! Its our anniversary weeked as well. Amazing to see what life brings. HAPPY ANNIVERSARY to one of my favorite bloggers! You brighten my day! I love this post!!! My 9th anniversary is coming up in August. Do you mind if I steal your great idea?? Congrats! I hope it just gets better and better for you two! Happy anniversary you love birds!! awwwwww beautiful! happy anniversary!!!! congrats on 11 years, that's a great accomplishment (esp this day & age)!! aw, congratulations!! that is such a gorgeous picture. and i love your number 7! so sweet. Happy Anniversary! Hope you guys have an awesome day! Happy Anniversary! Is he lucky to have you, or what? Happy Anniversary! I LOVE your wedding picture. He got a pretty girl! Here's to many, many more anniversaries! Happy Anniversary! Y'all were so beautiful (still are of course). Happy Anniversary! 1998 was a great year to get married. 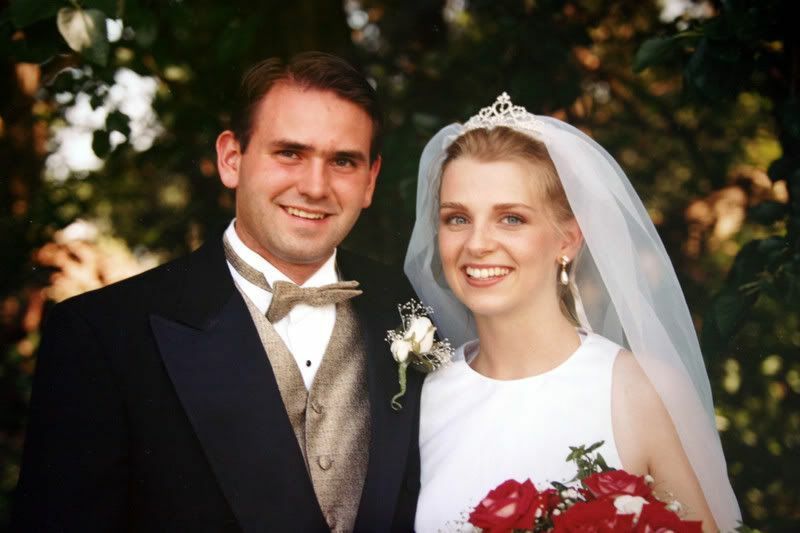 We will celebrate our 11th anniversary in Sept.
Hope you two had a wonderful day! wow Happy Anniversary!!! 11 years thats awesome. Our 3 year anniversary is in August, I wonder how we will on our 11 year anniversary. Ours is this week too! We are quite a bit further along though. It just gets sweeter! Ooooh! Happy Anniversary! Many blessings! What a beautiful wedding photo. Congratulations to 11 wonderful years and here's to many more!! Happy Anniversary! What a testimony. Love your wedding pic too. What a beautiful bride you were! Lovely post indeed! Was wondering whether you can tell me a good place to buy push toys for toddlers? How adorable....and a happy happy 11. What's not to love about it??? Awww. Love the pic! Happy anniversary! I hope your day was spectacular!!! Happy Anniversary and Many Many Blessings to you both! How cute! I just noticed that my daughter posted a comment here under my log in. So really, I wasn't telling myself Happy Anniversary. Haha! Aw, happy anniversary, you two! Sweet blog post! Happy Anniversary! I just went out with my hubby for the first time in 3 months. Before you had kids you take those dates for granted now you treasure them like no tomorrow! Hope your anniversary was wonderful! Loved this post! Perfectly said. Happy belated anniversary. We celebrated our 11th anniversary on the 11th.